Plastic Recyclers Southeast, Inc. was started in 1991 with a $6,000 loan, 7,000 square feet of leased warehouse space, and two employees. The initial building model revolved around the recycling and trading of post consumer, or curbside, PET and Polyethylene, but quickly transitioned to include post-industrial polymers. Within three successful years, Plastic Recyclers moved into the company's current headquarters on Church Street. The new facility initially had 30,000 square feet of warehouse space and 5,000 square feet of office space, but was expanded by 40,000 square feet in 1996. While helping several local companies with their recycling needs, Plastic Recyclers noticed the growing need for large scale, off-site warehousing. In 1998, Plastic Recyclers purchased several acres in the neighboring town of Trinity and finished construction of 80,000 square feet before the year was out. Our company has continued to grow to meet increasing warehousing and distribution needs and now has over 300,000 square feet of warehouse space. Our staff has expanded to include educated and experienced warehouse personnel, and we continue to invest in information technology programs that help us provide solutions for almost any warehousing issues our customers may encounter. 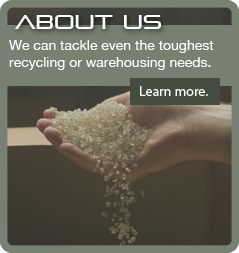 Today, Plastic Recyclers has over 400,000 square feet of operational and warehousing space. The staff has grown to more than 35 employees and the company is continuing to expand within the plastic recycling and warehousing sectors. With the continued growth, Plastic Recyclers strives to provide the best service at the most competitive price for our customers.